Rolex has long been associated with “tool” wristwatches, which originally were designed with a functional purpose in mind. From their collaboration with Pan American Airways for the GMT-Master dual time zone wristwatch, to the Submariner watch for professional deep-sea divers, these timepieces have captured the imagination of collectors and are today highly sought after in the international market. The Milgauss, reference 1019, is another example of a Rolex sports model that today enjoys considerable prestige beyond its original intent. Originally released in 1954, the Milgauss reference 6541 was designed to meet the needs of scientists and engineers working in a magnetic environment. Rolex worked in collaboration with the Conseil Européen de Recherche Nucléaire (CERN), to develop an inside Faraday Cage that would allow the watch to withstand up to 1000 Gauss of magnetism. Hence its name: “Mille Gauss” meaning a thousand Gauss in French. 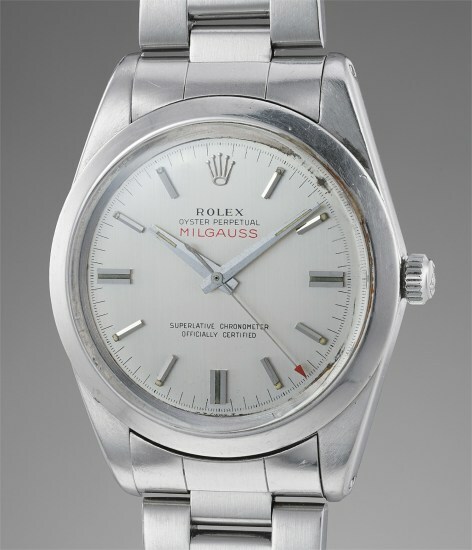 Along with its companion piece the reference 6543, the two remained in production until the beginning of the 1960s when Rolex released the reference 1019. The new reference featured a fresh and modern update to its appearance such as a smooth bezel and a modified dial layout. Early models, like the present one would have square luminous dots and luminous indexes at 3,6 and 9 as well as 1/5 hash markers around the dial. Only later examples would feature 1/2 hash marks. Reference 1019 was available with a silver or matte black dial, and ceased production around 1990. Furthermore, this watch presents an extremely rare -T Swiss T- dial indicating the use of Tritium as a luminous material. At the time of production, the reference was not particularly successful and production numbers were low. The model is highly sought after today due to its rarity.